Two years have passed since the Fort McMurray wildfire and the Red Cross says it’s still on the front lines offering assistance to families who need help. Two years after a wildfire devastated Fort McMurray, the Red Cross says it is still on the front lines offering assistance to those in need. On the second anniversary of the 2016 wildfire, the agency said it has spent most of the money donated but still has more to hand out. 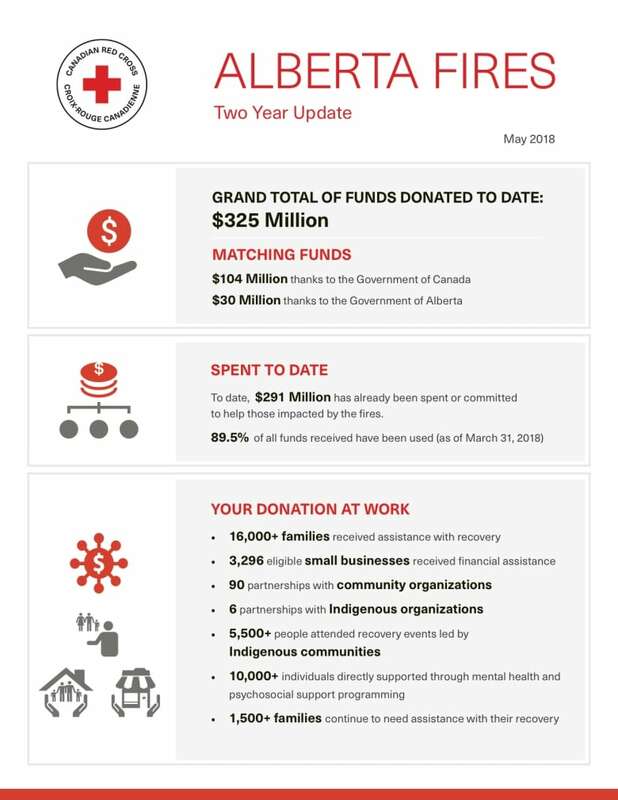 On Tuesday, the Red Cross presented an overview of the record-setting $325 million Canadians and the federal and Alberta governments have donated to help wildfire victims. Almost 90 per cent of that total, $291 million, has already been spent or committed, the agency said. About $213 million went to individuals and families for accommodation, to replace household goods, for assistance with paying mortgages, rent and for reconstruction of uninsured homes, the agency said. Another $50 million went to community groups such as shelters and the food bank, while $30 million went to support small businesses. About $6.2 million was spent by the Red Cross on fundraising costs. The Red Cross has seen people who weren't in need a year ago appear at its downtown Fort McMurray office, said Jennifer McManus, vice-president for the Alberta and Northwest Territories. As the recovery continues many families have run out of insurance money, fallen behind on mortgages or face the prospect of filing for bankruptcy, she said. "Our team is still very busy in Fort McMurray," McManus said. "We are meeting one on one with families and individuals in the community. And what we are seeing is that people's needs are emerging over time. "And we are actually seeing new families and individuals come in and ask for assistance when they thought they could do it alone." The local government can do little to help wildfire victims at this point, said Don Scott, mayor of the Regional Municipality of Wood Buffalo. He urged those struggling with finances or insurance claims, and those dealing with stress, to seek help from aid organizations. "I try to emphasize to people, the Red Cross is still in our community helping people," Scott said. "Some people may not be aware the Red Cross is still offering services that they may have not offered before. "I am hoping people will reach out to the Red Cross if they need it." There's no end date for when the Red Cross will wrap up its operations, said McManus. The relief agency said it will continue to monitor the recovery, and the needs of residents will dictate how long it remains. The Fort McMurray wildfire was Canada's largest insured disaster with more than $3.7 billion in losses. It destroyed 2,579 homes and as of April, fewer than one-fifth have been rebuilt.